"On the rocks" redirects here. For other uses, see On the Rocks. Various unique terminology is used in bartending. Look up straight up in Wiktionary, the free dictionary. In bartending, the term "straight up" (or "up") refers to an alcoholic drink that is shaken or stirred with ice and then strained and served without ice in a stemmed glass. There is substantial confusion in the usage of "neat", or "straight up", "straight", and "up". In the context of describing ways of serving a drink, all of these mean "served without ice", but only "neat" implies serving the drink at room temperature. Some bar patrons and bartenders use the terms inconsistently. The terms "straight" and "straight up" can be ambiguous, as they are sometimes used to mean "neat"; "neat" and "up" are relatively unambiguous. "Straight" is often used interchangeably with "neat" (in the United Kingdom, Canada, and the United States). However, "straight" is also often used to refer to a spirit that is in an unmixed state in general, in addition to being used to describe a way of serving it. For example, many bourbons are identified as "Kentucky straight bourbon whiskey" on their bottling labels, and U.S. Federal law contains a legal definition of the term "straight whiskey". So sometimes "straight" may be used to mean either "straight up" (as defined above) or "neat", and clarification may be needed to determine the exact manner for serving it. Look up neat in Wiktionary, the free dictionary. A drink served "neat" is a single, unmixed liquor served without being chilled and without any water, ice, or other mixer. Neat drinks are typically served in a rocks glass, shot glass, snifter, Glencairn glass, or copita. Look up on the rocks in Wiktionary, the free dictionary. "On the rocks" refers to liquor poured over ice cubes, and a "rocks drink" is a drink served on the rocks. Rocks drinks are typically served in a rocks glass, highball glass, or Collins glass, all of which refer to a relatively straight-walled, flat-bottomed glass; the rocks glass is typically the shortest and widest, followed by the highball which is taller and often narrower, then the Collins which is taller and narrower still. "With a twist" signals the bartender to add a "twist" of the zest of a citrus fruit (bar choice, if unspecified) to the cocktail. 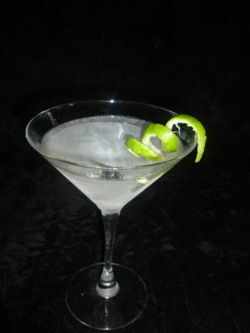 Often, the bartender will hang the rind of the citrus on the glass as a garnish (see martini photo above). Cocktails are generally served chilled, although some (e.g., margaritas) may be served either with or without ice, and this must be specified. Cocktails can be served "frozen", which is with crushed ice instead of cubes. Unmixed liquors may be served either neat, up, or on the rocks, with differing conventions. High-quality whisky and other aged liquor are most often served neat, while lower-quality whisky is usually served with a mixer or on the rocks. Vodka can be stored as a liquid well below the freezing point of water because of its high proof and low particulate content, and cocktails made with sub-freezing vodka are sometimes requested to minimize the amount of added water from melted ice during shaking. Look up chaser in Wiktionary, the free dictionary. A shot of whisky, tequila, or vodka, when served neat in a shot glass, is often accompanied by a "chaser" (a mild drink consumed after a shot of hard liquor) or a "water back" (a separate glass of water). These terms commingle as well; it is common in many locales to hear a "beer back" ordered as the chaser to a shot. A drink may specifically be ordered "no chaser" as well. A "chaser" in the UK however usually refers to a shot taken after a pint of beer or similar. Drinks establishments will often have a lower-priced category of drinks, known as "well drinks" or "rail drinks", and a higher-priced category known as "top-shelf" or "call" drinks, and will use upselling by offering the higher-priced category when taking orders. The terms come from the relative positions of the bottles of spirit used for the drinks; the cheapest version of a spirit offered by a bar is typically stored in a long rail or "well" making it readily available to a busy bartender, while the more expensive, better-quality liqueurs and spirits are displayed on shelves behind the bar where they attract patrons to the available selection. A "pony" is slang for one US fluid ounce (30 ml) of spirit, while the standard-size "shot" of alcohol is a 1.5-US-fluid-ounce (44 ml) "jigger", with a "double" being three US fluid ounces (89 ml). Rather than use measuring equipment, professional bartenders usually use a pour spout inserted into the mouth of the bottle, which restricts the flow of liquid to a standard rate allowing reasonably accurate time-based pours. For instance, a "6-count" is a common analogue for a 1.5oz jigger, which can be trained to by having the bartender upend the bottle (with pour spout installed) and counting to 6 out loud as quickly as the words can be said clearly. This method breaks down into convenient sub-measures; each count is approximately one-quarter fluid ounce, making a "pony" 4 counts and a "half-jigger" 3 counts. This system is not perfect because liquids of different viscosities will pour at different rates through the same spout, but it does allow consistent pours from drink to drink for a consistent result from each bartender, while being much faster than using a thimble measure or similar spirit measure. ^ a b Walkart, C.G. (2002). National Bartending Center Instruction Manual. Oceanside, California: Bartenders America, Inc. pp. 104 and 106. ASIN: B000F1U6HG. This page was last edited on 23 March 2019, at 00:56 (UTC).